OMEGA's new CL1500 Series benchtop dry block probe calibrator is fast, accurate, and portable. It features a lightweight, rugged design suitable for both laboratory and field use. This hot/cold calibration source can accommodate probes of 6 different diameters and is available in either 115 or 230V versions. There are two different well styles available, standard and metric. The CL1500 Series uses a custom fabricated metal enclosure together with a high performance PID temperature controller to achieve a high level of quality, reliability and safety. The calibrator has a temperature calibration range of -5 to 125°C (23 to 257°F). Each CL1500 comes with power cord, complete operator's manual, RS232 cable (RS232 to USB converter cable also included), software and NIST traceable calibration certificate.The CL1500 software allows the user to control and monitor the temperature and performance of the calibrator in real time. The user is presented with 3 displays of the current temperature and setpoint, an analog dial, a digital display and also a graph with adjustable scale. It also allows fast and easy changes to be made to the setpoint through the use of 10 presets or using the course adjustment knob and fine tune buttons. 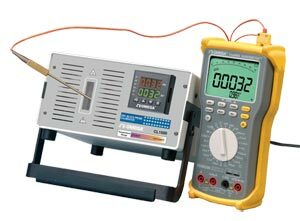 참고: Comes with power cord, complete operator's manual, RS-232 cable, RS232 to USB converter cable, free software and NIST-traceable calibration certificate at 0, 38, 100°C (32,100, 212°F). ** Consult sales for additional probe and meter options.